Hi Job-seekers! Still no job? 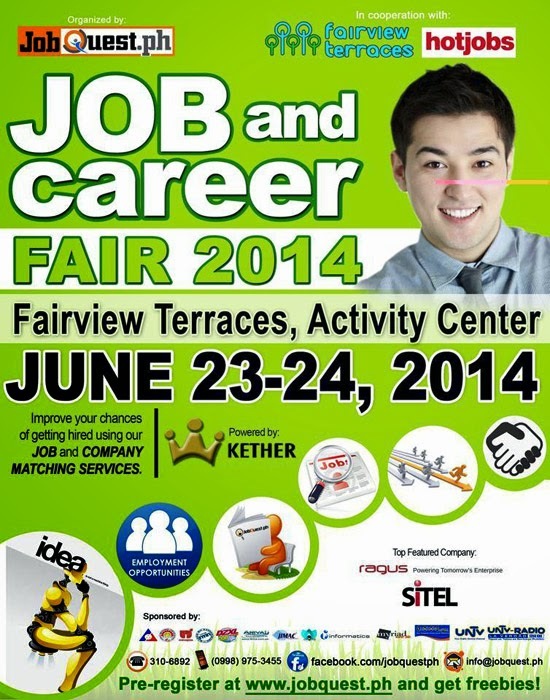 Here's another Job and Career Fair June 2014 which organized by JobQuest.ph in partnership with Fairview Terraces and Hot Jobs will happen on June 23 & 24, 2014 at the Fairview Terraces, Activity Center. Increase your chances of getting hired using JobQuest.ph's JOB and COMPANY MATCHING services for FREE! 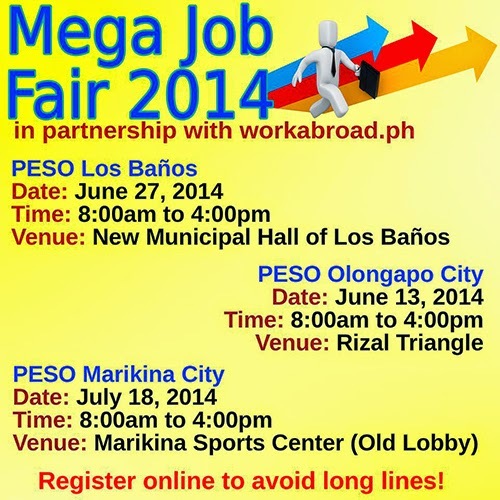 You may also pre-register at www.jobquest.ph to avoid falling in line and get freebies. Visit JobQuest.ph Facebook page for more details and latest updates. Hi Boholanos! 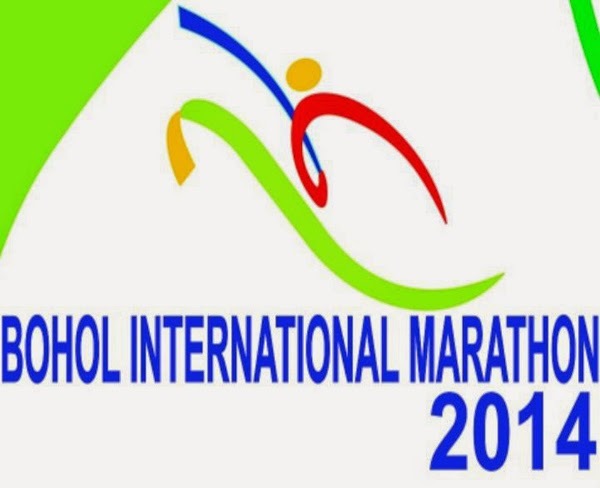 Come and run with the Bohol International Marathon 2014 will happen on August 24, 2014 at Panglao Town Plaza Kilometer Zero, Bohol. Experience fun running with your friends, family and colleagues and enjoy the 5Km, 10Km, the Half (21Km) and Full (42Km) Marathon. 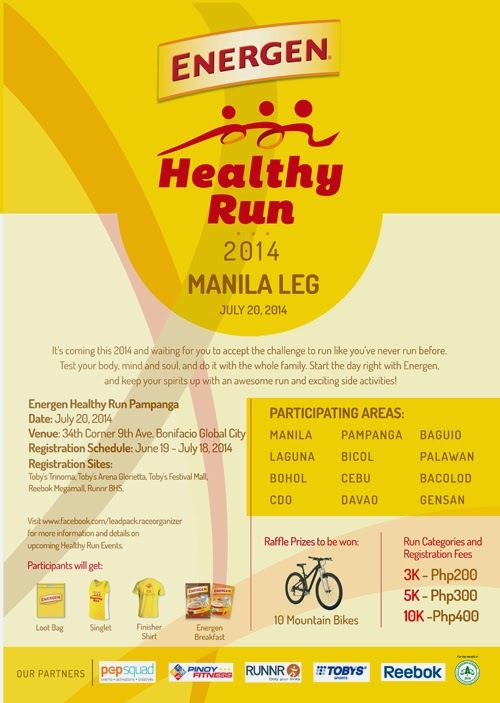 Registration is from June 1, 2014 to July 31, 2014. Register Now! 2. 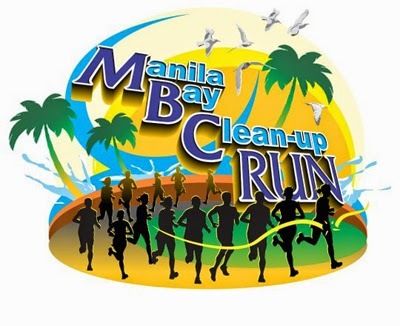 Please deposit registration fee at METROBANK, Account Number: 007712002707, Account name: Ma. Ermalinda C. Amores. 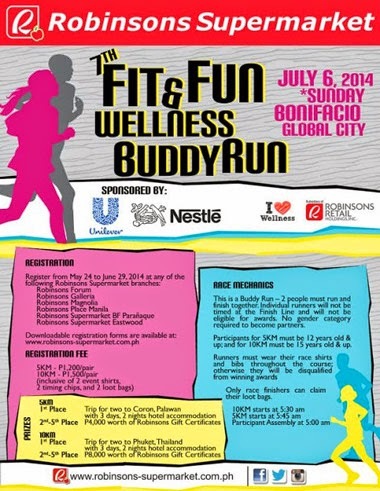 (Two or more participants may use one bank transaction. Please write the name/s on the official Metrobank receipt). 3. 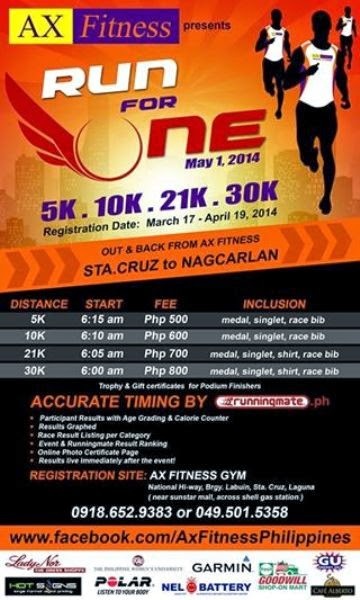 Scan the registration form and Metrobank receipt then E-mail to boholmarathon2014@yahoo.com.ph. A confirmation letter shall be sent through your E-mail. 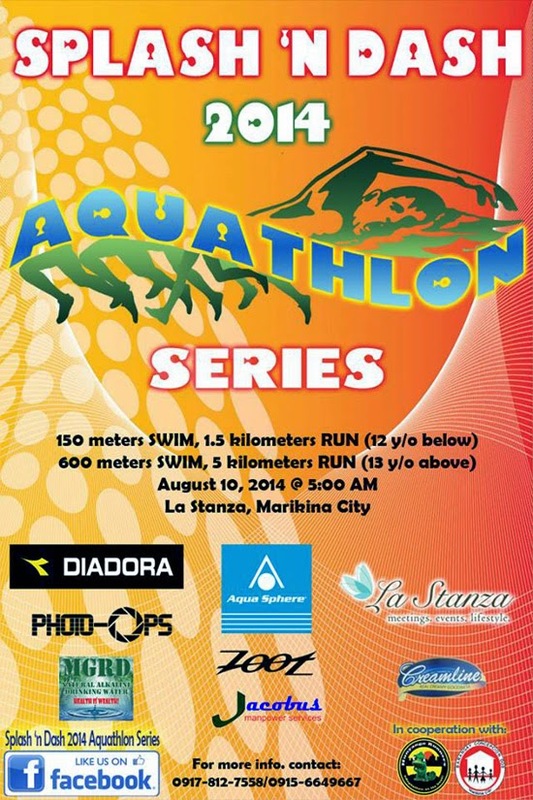 Visit Bohol International Marathon Facebook page for more details and latest updates. 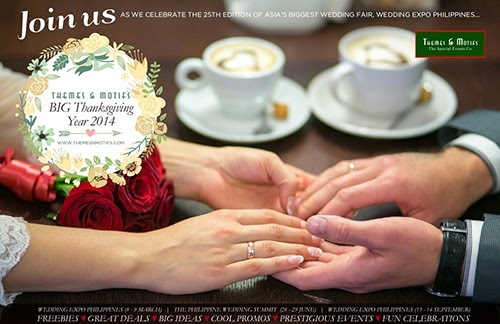 Themes & Motifs, the Philippines' most prestigious wedding fair organizer will celebrate its BIG Thanksgiving Year 2014 and they are inviting you to the The Philippine Wedding Summit's 9th Year celebration, the grandest and biggest midyear wedding fair will happen on June 28 & 29 2014 at Ground Floor, SMX Convention Center, SM Mall of Asia Complex. There will be an Pre-Register for FREE ADMISSION and to get exclusive freebies, great deals, special promos and many more! Visit www.themesnmotifs.com for more details and Themes & Motifs Facebook page for the lates updates. 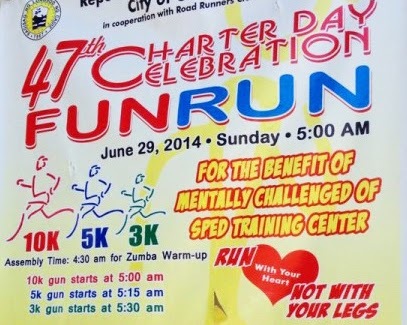 Come, join and run with your family and friends as the Chevalier School Batch 1990 and the CS-PTA Foundation brings the Run Caballero Fun Run 2014 that will happen on June 21, 2014 at CDC Parade Grounds, Clarkfield Pampanga. The said event is for the benefit of the Students scholarships & other Programs of the CS Batch '90. Register Now! 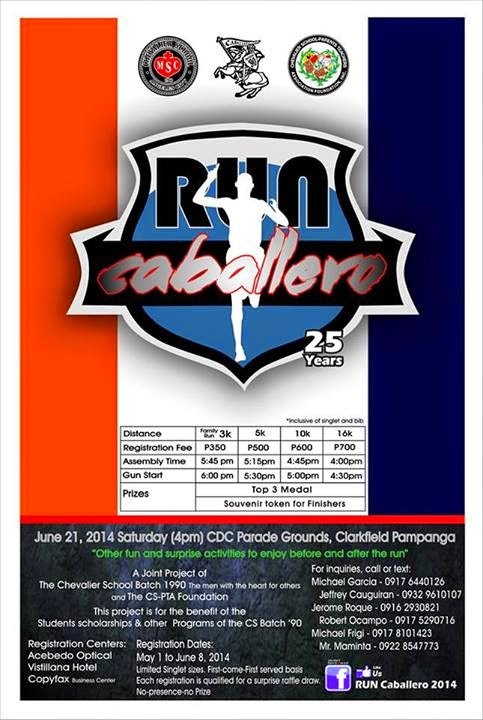 Visit RUN Caballero 2014 Facebook page for more details and latest updates. 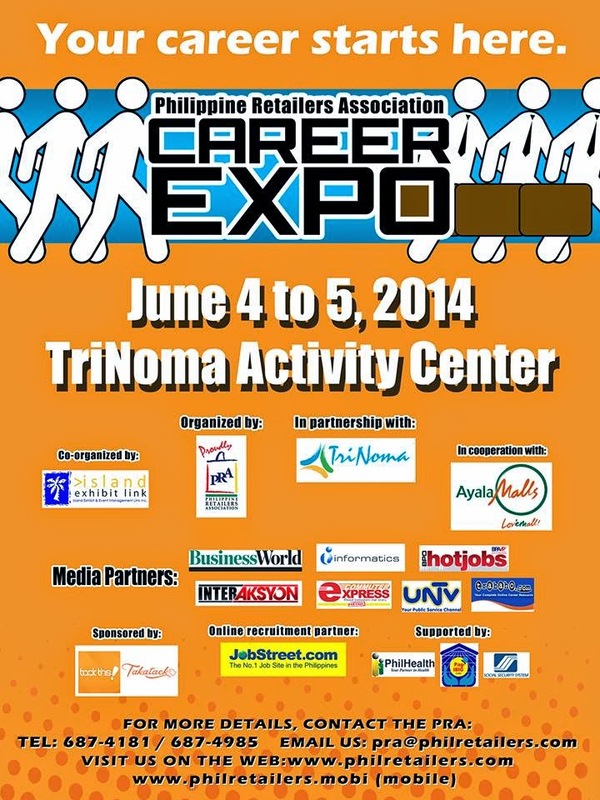 Philippine Retailers Association will be conducting PRA Careers Expo Job Fair June 2014 that aims to help more prospective job seekers to land on their desired career path. 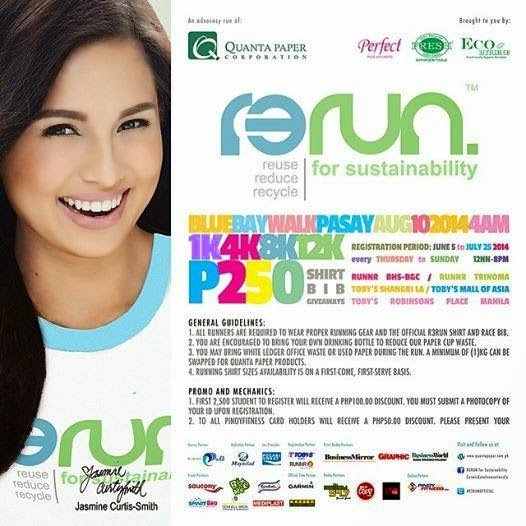 This will be held on June 4 & 5 at the Trinoma Activity Center, Trinoma Mall Quezon City. The event is co-organized by Island Exhibit Link which is a pioneer in conducting massive job fair events in different malls within Metro Manila. You can meet many company representatives from corporations of different industries and sizes. Hi jobseekers out there! This chance to get your preferred job that fits your skill. 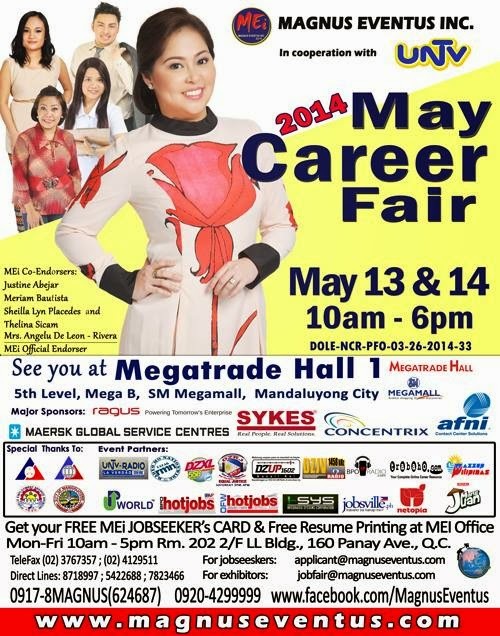 Come and join as Magnus Eventus Inc. brings you 13th MEI Job Fair June 2014 that will happen on June 19 & 20, 2014 at the 2nd level Trade Hall of Starmall EDSA-Shaw, Mandaluyong City. FREE Resume Printing! Hi Job-seekers! 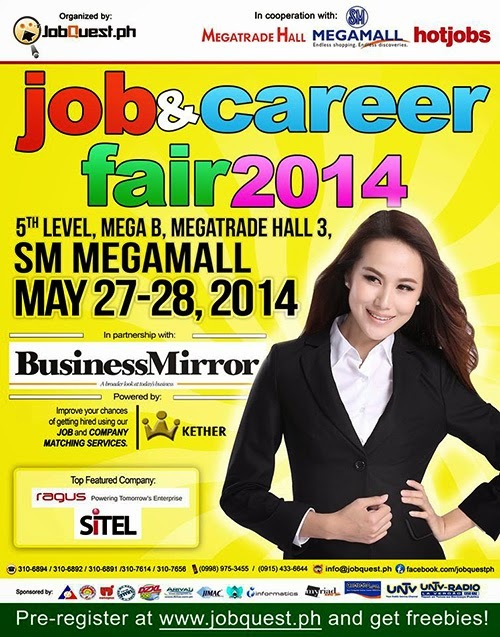 Come and join JobQuest.ph in partnership with Business Mirror in a Job & Career Fair May 2014 to be held on May 27-28, 2014 at the 5th Level, Mega B, Megatrade Hall 3, SM Megamall, Mandaluyong City from 10 am to 6pm. Increase your chances of getting hired using JObQuest JOB and COMPANY MATCHING services for FREE! You may pre-register at www.jobquest.ph to avoid falling in line and get freebies. Visit JobQuest Ph Facebook page for more details and latest updates. Hi job-seekers! Get ready with your resumes and set your best foot forward as Philippine Star will hold the JOB FAIR Local & BPO 2014 to help you find the career path that you wish to take. 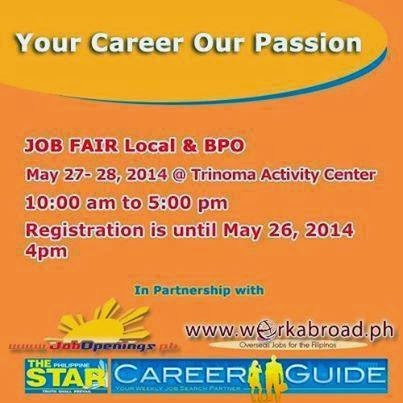 The Philippine Star JOB Fair 2014, in partnership with www.jobopenings.ph and www.workabroad.ph, will lead you to the latest job openings from various industries on May 27 and 28, 2014 from 10:00 am to 5:00pm at the Trinoma Activity Center! You may now register online and be able to download the necessary forms for an instant access to this event. Don't miss the chance to get your dream job! 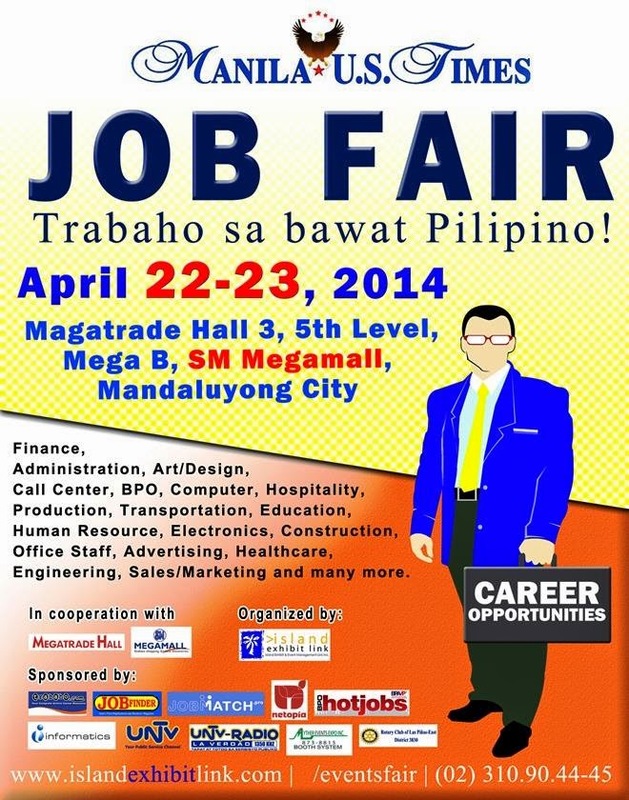 You also register online thru www.jobopenings.ph/jobfair as early as now for an instant access to the event. Print do not forget to print the needed form and bring it at the venue. Visit Jobopenings.ph facebook page for more details and latest updates. There is so much joy and fulfillment in participating in a child's development of his/her own potential. 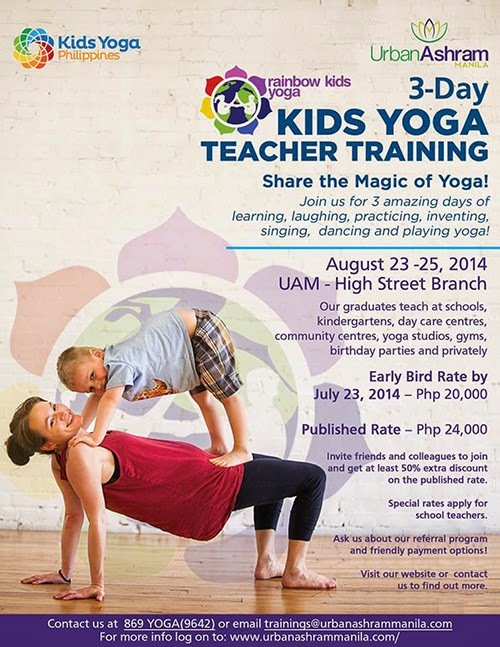 Join and Sign up for the 3-Day Rainbow Kids Yoga Teacher Training at Urban Ashram Manila - Center for Yoga this August 23-25, 2014. Enjoy the 3 amazing days of learning, laughing, paracticing, inventing, singing, dancing and playing yoga. Join Now! You can friends and colleagues to join and get at least 50% extra discounts on the published rate. Visit Kids Yoga Philippines Facebook page for more details and latest updates. It's about time that world sees you! 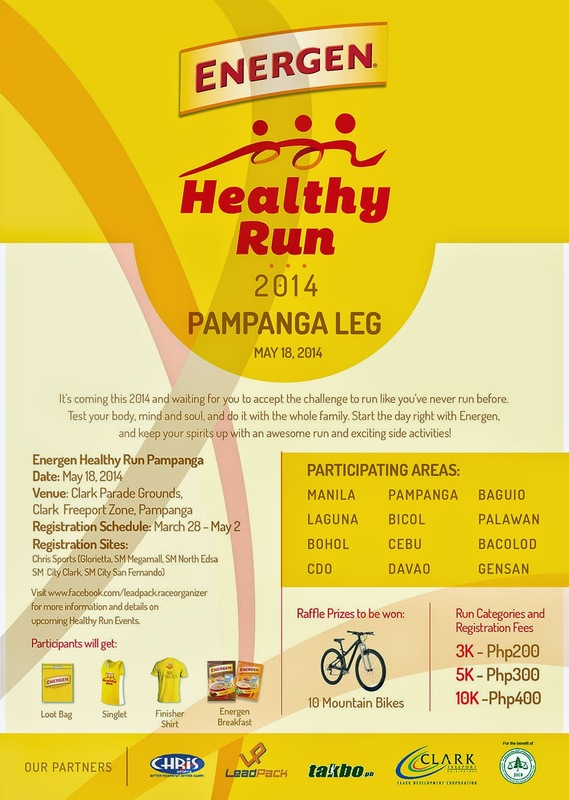 Join the BIG Shift DANKA Summer Saya 2014! Take classes with the world champs our world-class choreographers at BIG Shift DANKA this summer 2014! Master different dance styles! Perform your class piece with your coach and teamates on cam! Upload that video on YouTube for your family, friends and world to see! Visit BIG Shift DANKA [Dance & Kinetic Arts] Studios Facebook page for more details and latest updates. Learn from the best! Be ready to Strut your Stuff! 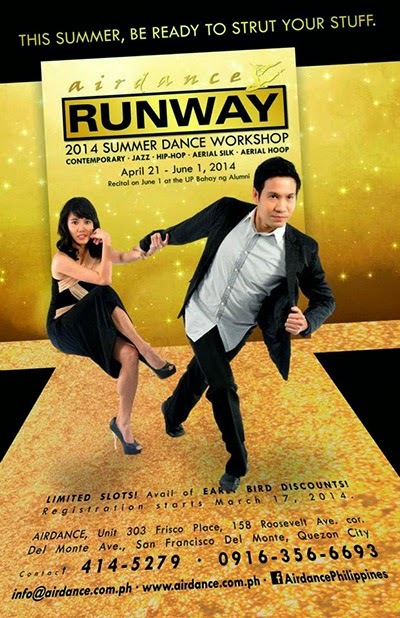 For the first time in history, Airdance Company will be conducting Aerial classes this year's summer workshop entitled "AIRDANCE RUNWAY", which will start from April 21 with a recital on June 1,2014 at the UP Bahay ng Alumni. Visit AirdancePhilippines Facebook page for more details and latest updates. Hi jobseekers! Update your resume and get ready for the biggest job fair! 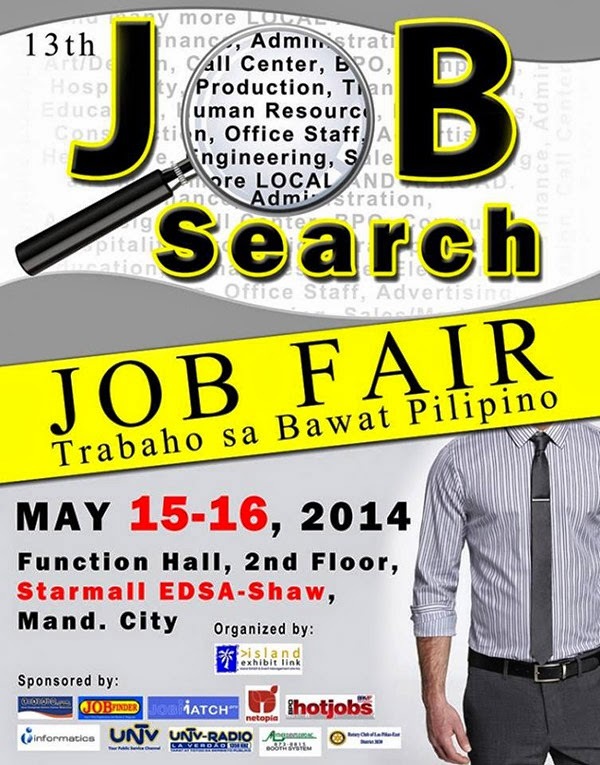 As Island Exhibit Link presents the 13th Job Search Job Fair with the theme "JOB FAIR: Trabaho sa Bawat Pilipino" on May 15-16, 2014, from 10:00 AM-6:00 PM at Trade Halls A and B, 2nd Floor of Starmall EDSA-Shaw, Mandaluyong City. Get ready with your portfolios, some requirements needed and choose the position that best fits your qualification. 13th Job Search Job Fair "Trabaho sa Bawat Pilipino"
Island Exhibit Link's 13th Job Search Job Fair is FREE ADMISSION and you can REGISTER ONLINE, where can go straight to job hunting and not be bothered by pre-registration during the event. Visit Islandexhibit link Facebook page fore mode details and latest updates. Hi fresh grad and jobseekers! 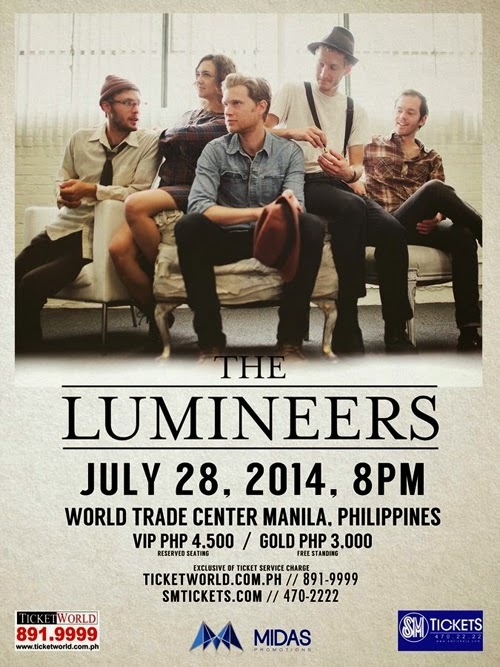 Here's a good news for you! Come and join month's job fair as the Magnus Eventus in cooperation with UNTV presents the 2014 May Career Fair on on May 13 & 14 from 10am-5pm @ Megatrade Hall 1, 5th Level, Mega B, SM Megamall, Mandaluyong City. There will be FREE printing of resume! Various industries will be there such as BPO, Manpower, Overseas and Direct companies.